President Donald Trump on Wednesday said his recent comments about Saudi Arabia's denials of any involvement in the disappearance of Washington Post columnist Jamal Khashoggi were not an attempt to give the oil-rich ally cover. His comments came amid swirling speculation that Turkey may have audio tapes that reveal what happened to Khashoggi, a Saudi journalist and royal insider who has been missing for over two weeks after entering the Saudi consulate in Istanbul. Secretary of State Mike Pompeo met with Turkish President Erdogan and Foreign Minister Mevlüt Çavusoglu Wednesday but refused to express any doubt or skepticism about the legitimacy of a Saudi investigation into Khashoggi’s disappearance. Turkish President Tayyip Erdogan meets with U.S. Secretary of State Mike Pompeo at Esenboga International Airport in Ankara, Turkey, Oct. 17, 2018. But Pompeo declined to say anything about the tapes, initially telling reporters, “I don't have anything to say about that.” His spokesperson later clarified he has not heard any tapes. It's unclear if Turkey offered him the chance to hear any such recordings. Pompeo also said the U.S. must wait for the investigations to be completed before responding, casting doubt on the Turkish claims and underscoring the importance of U.S.-Saudi ties. “We need to know the facts before we begin to formulate what the appropriate response for this would be,” Pompeo said. “I do think its important everyone keep in their mind we have lots of important relationships, financial relationships between U.S. and Saudi companies, government relationships, things we work on together all across the world,” saying these relationships are in Americans’ best interests. President Trump echoed Pompeo on the importance of the U.S. relationship with Saudi Arabia in an interview with Fox Business News this morning. Asked if he was going to walk away from Saudi Arabia if the investigations reveal a hit job on Khashoggi, Trump said “I don’t want to do that,” citing a $110 billion weapons deal with the Kingdom. “I hope that the King and the crown prince didn't know about it. That is a big factor in my eyes. I hope they haven't,” Trump said, referring to King Salman and Crown Prince Muhammad bin Salman of Saudi Arabia. Trump said he planned to see Pompeo either Wednesday night or Thursday morning to get a readout of his meetings with the Saudis and Turks. Despite that, Pompeo reported that President Erdogan felt the Saudis have been cooperative, and the two countries will share information. 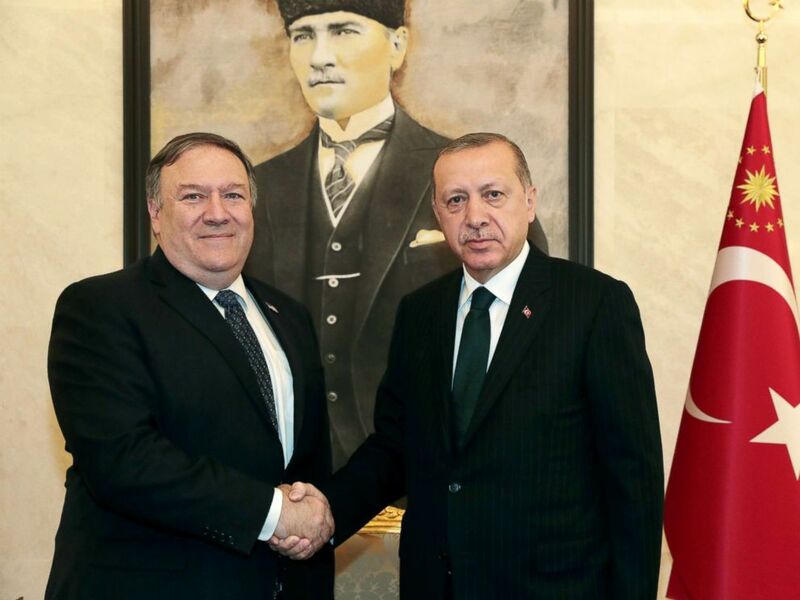 Erdogan said there had been “a couple of delays,” according to Pompeo, but the Turks feel confident now the Saudis will admit them to the consulate to perform their investigation. ABC News' Alex Mallin contributed to this story.